With the April 2014 closing of the Ovation Factory in Hartford, CT, we lost one of the most influential American guitar manufacturers. While the guitars are still being produced in less expensive labor markets (China, South Korea and Indonesia), the loss signifies a huge change for an American original. Not only did Ovation develop both the Lyrachord bowl-back in 1966 and the first solid-body electric guitar with active electronics (the Breadwinner), it also produced the first signature guitar for an African-American, Josh White, in 1967. Ovation was the brainchild of aerospace engineer, Charles Kaman (1919-2011), who founded the Kaman Aircraft Corporation. Mr. Kaman was an avid guitar player, and he had tossed around the idea of building guitars for much of his life. When his company encountered some tough years financially, he decided to expand into guitar making. The first Ovation prototype was ready in 1965, and it featured a flat, synthetic back. When this design proved to be unstable, Ovation moved to a parabolic back shape, developing Lyrachord. An early sales brochure described Lyrachord as “an aerospace material – resin-impregnated silicone fiber…more voluminous sound cavity housing… this material also [can] be ‘tuned’ chemically and with heat to have precisely specified resonance properties.” The Lyrachord back made the guitars nearly indestructible and also very loud. For these reasons Ovations were quickly adopted by the booming folk-scene as a guitar that could be played outside in a group and still heard without amplification. The first Ovation was released in November 1966. Shortly afterward, Ovation signed Josh White on as an endorser. Their signature model for him was a bit of a hybrid. It had the nut-width and slotted headstock of a classical but the bracing of a steel-stringed flattop. 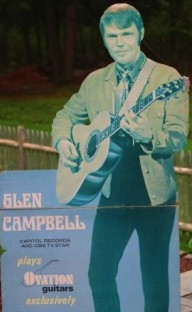 Sales really took off when Glen Campbell signed on to play Ovation exclusively with his two signature models in 1968: a Deluxe Balladeer and a slot-head 12-string. Within the first two years of production, Ovation released both acoustic-electric and hollow-body electric guitars. They built amplifiers to accompany their new electrified instruments, they were offering nearly every guitar accessory you could dream of at the time. Ovation made a big splash when it entered the market, and the company has since been on the leading edge of technology, unafraid to try different designs in electronics, amplification and acoustics. One of the more interesting additions was the high-end Adamas line. Most Adamas’ were built with carbon fiber tops and eschewed the traditional sound-hole configuration by using either 22 or 15 feedback reducing little sound-holes. This feature made it into the general Ovation design and lately has become nearly as synonymous with Ovation as the round back. Kaman became larger through the years and was bought by Fender in 2007. The two companies combined created the largest musical instrument and accessories provider in the world. Production began a gradual shift away from the US factory, culminating in the ceasing of all United States Ovation production in May of 2014. 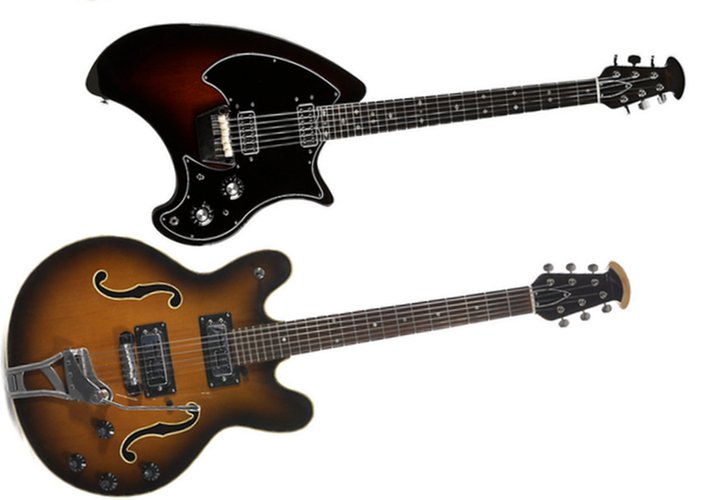 Two '70s Ovation Electrics. A Deacon (top) and a Tornado (bottom). The current market for used, American-made Ovations is quite soft. Several factors make them a bargain. The “bowl” is a far cry from the traditional guitar design of solid wood, thus a portion of the purist community has been known to refer to them as “not real guitars”. Also, their sound is different than the traditional guitar. 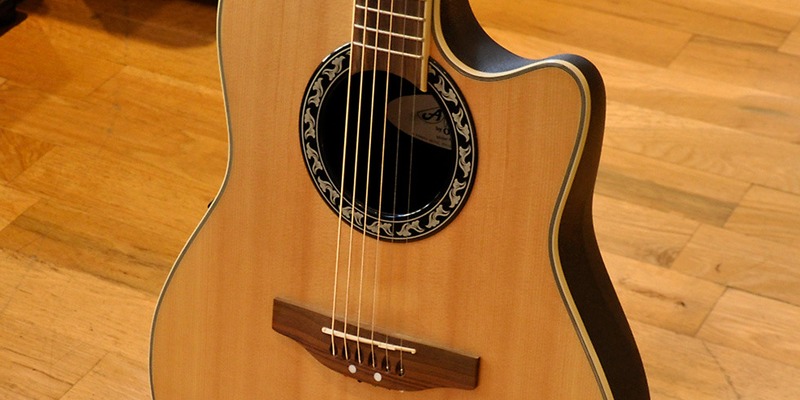 Whether you think their sound is good or bad, Ovation’s have a unique sound; it is different and may not be what every guitar player is seeking. 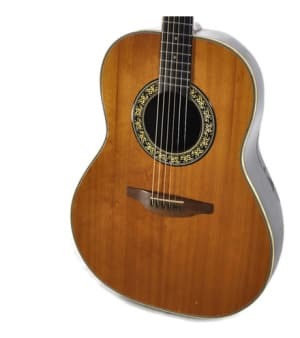 These points of differentiation from the traditional guitar make Ovation a bargain in today’s used market. This is especially true when you consider how influential the Ovations were on the music culture of the 1960s, 1970s and 1980s. The early guitars had a smooth, shiny surface to the backs and are referred to as "shiny-bowl" Ovations. Later guitars had a textured back, which was easier to hold. Shiny-bowls also had patent pending Grover Rotomatics and an inlaid sound-hole rosette, while later guitars had the rosette attached to the top. The earlier shinny back Ovation body versus the textured back of later years. Because they were partially made of a material that wasn’t affected by humidity, many owners were less considerate of the guitar’s needs, especially in the early years. It is common to find older Ovations with top cracks or repaired top cracks. Ovation originally would repair any cracks or other issues under warranty at their now-closed Hartford, CT factory. It is not uncommon to find guitars with very old top cracks that were expertly repaired with a total refinish decades ago, and thus do not show the typical signs of repair work (like overspray). The sound-hole rosette can shrink on the shiny-bowls and separate from the top. Aside from the early guitars, which were more fragile, Ovations are nearly indestructible. If they have been cared for at all, there should be no structural issues. Many of the Ovations from the 1980s or earlier were US-made (unless stamped otherwise) and can be bought all day long in the sub-$1,000 price range (often for less than $500). If you’re looking for a model of more historical significance and in the collector’s condition grade, you may expect to pay closer to $1,000 or $1,500. Most of the electrics disappeared from Ovation’s catalogue by the mid-1980s, but with some digging it’s possible to unearth a hollow-body, solid-body (with or without active electronics) and electric bass. Ovation has primarily focused on building acoustic-electric guitars since the 1980s, which is most of what you’ll find on the used market.